Your patients may have some initial reservations when you recommend endodontic therapy. This root canal brochure will walk patients through everything they need to know before the procedure. It also covers endodontic treatments step by step so your patients know what to expect. 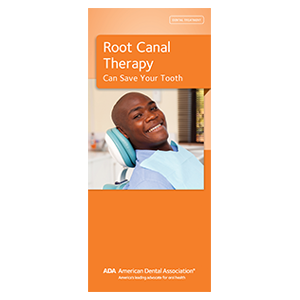 When you give your patients this ADA root canal treatment brochure, you’re helping them focus on the restorative benefits of this common therapy. Order your copies of Root Canal Treatment today!